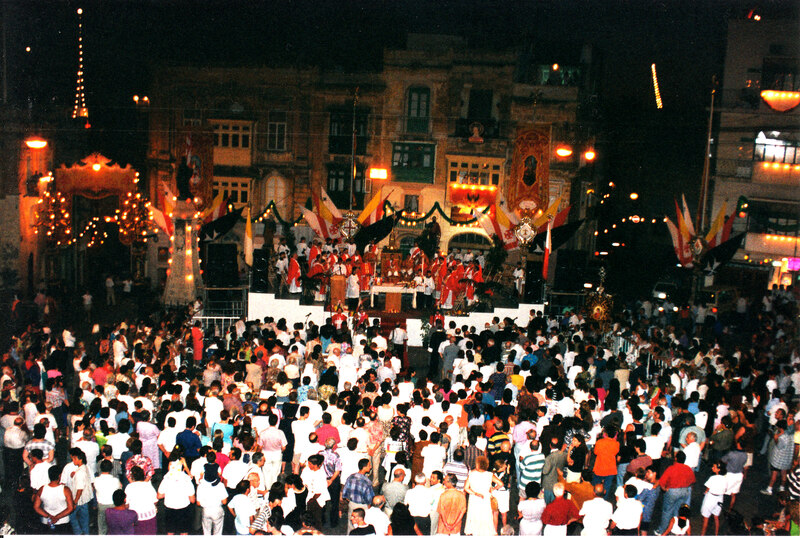 It was during the 1996 feast of Saint Lawrence when Mr. John Boxall remarked that to complement the view of the square there was a missing artistic band stand fitting the beautiful main square of Birgu, along with Emmanuel Attard. Mr Scicluna agreed with him, and decided to submit this proposal for an artistic band stand to Mr. Lawrence V. Farrugia, President of the Club. 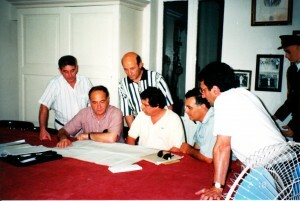 Faced with the fact that there were no further details on this project, there were other various problems such as where it could be stored, the financing to thousands of Maltese Liri, maintenance and its cost, human resources to equip and dismantle the stand and the technical proportions with which entails a project of this size. However, this proposal was put before the Central Committee after a long debate in which it was agreed, on condition that the financial responsibility of this project shall fall under the remit of a specially set sub-committee. A few days later an Extraordinary General Meeting was held, which approved the project. This sub-committee was presided by Lawrence V. Farrugia as President, Mr. Scicluna, Emmanuel Attard, Anton Gellel, John Boxall and John Raggio. The first three members remained in this sub committee till the end of the project. The sub-committee immediately began to meet regularly and work was carried out, so that in September of the same year it convened a meeting on Sunday morning for the feast enthusiasts where it was explained to them this ambitious project and were encouraged to give their contributions. Without any information and design the estimate for this band stand was about Lm 30,000. It was quite lucky that there was no information at the time, as that would have stopped the project in its tracks. Now that it stands completed, the cost for this project exceeded € 240,000 (Lm 100,000). Undoubtedly this is the largest project ever undertaken by a voluntary organisation in our town. A meeting with Saviour Bugeja, who was known for his works in feast decorations and had experience with other band stands, was held and he agreed to undertake the design and sculptures of the band stand. Although the sub-committee wanted to have a working estimate for his work, the lack of plans and designs made that impossible. Mr Bugeja soon made a design panel and pillar contour stands. This was put in the notice board of the club and was very well received, and of course helped an increase contributions to this project. Mr Horace Fenech, who was Chief Draughtsman at the Malta Drydocks, was approached to design the iron framework. He agreed to make the design as well as the list of materials and sizes to cut the material. As Horace Fenech was a personal friend of Lawrence V. Farrugia, he worked free of charge. After many hurdles to find a place where to begin manufacturing the iron frame, finally an agreement with the Curator of Maritime Museum was reached and a warehouse was allocated under the clock which completes the building of the Maritime Museum. The necessary material and machinery was bought and members of the sub-committee, together with a number of volunteers, started work with the greatest enthusiasm. The welding work done by Mr. Anthony Callus. 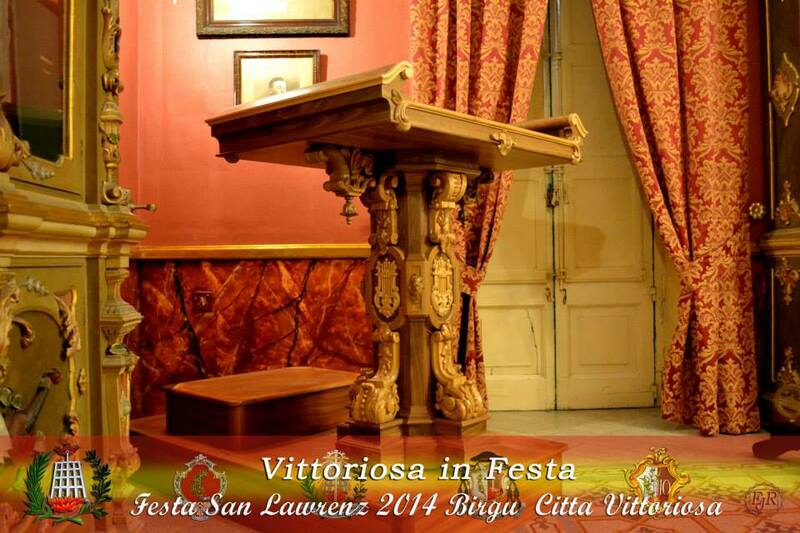 The thought was that the iron structure was to be used in the 1997 Feast of Saint Lawrence. 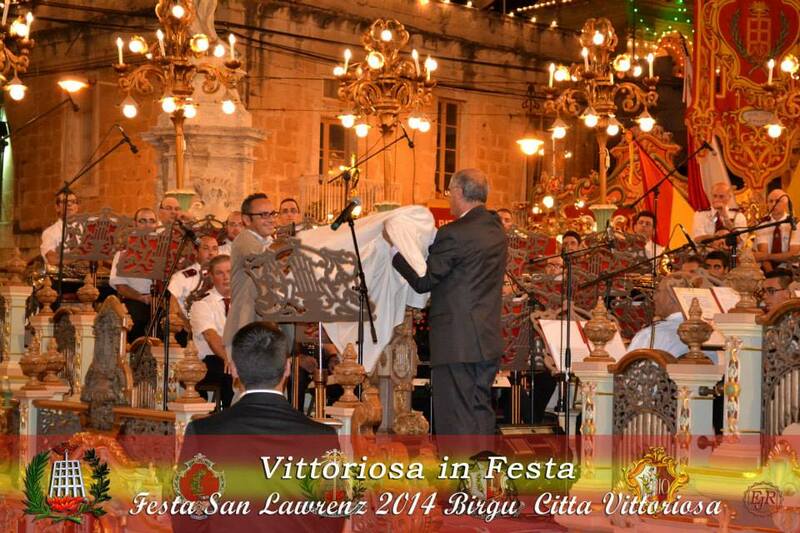 This objective was reached and this band stand, which at this time nobody was aware of its beauty and artistic value once completed, was baptised and inaugurated during a solemn celebration in a square full of people, when Vittoriosa greeted the holy relic of the skull of Saint. Lawrence which was brought to our country for the first time. However, when third parties are involved you cannot commit to a completion date, especially on such a large project with involvement of a number of contractors. This cost much running around, arguments and loss of hope to who was responsible for coordinating this project. During the feast of 1999 the panels and around pillars were erected for the first time, chairs costing Lm 25 each and collected by individuals, music stands were made along with the first bronze bust of the composer ‘Giuseppe Verdi’. After that the sub-committee had the first pieces of sculpture panels as well as grotesque masks to be put on the pillars, it met to decide whether to use the fibre, that was more ductile and very cheap. But the Commission decided that no fibre should be used on the band stand and all sculpture was the be made of wood. Therefore, the necessary contacts were made and an order was made for a container yellow pine from England, since this material is soft and easy to sculpt. On Christmas of the same year, the artist Paul Camilleri Cauchi gave us the first painting of the eleven commissioned, and it must be said that this was commended by everyone. During the millennium year not much work was completed, however, a lot of preparatory work was taken care of. So in 2001 the band stand began to be dressed and the baseline across the bandstand completed and there were two complete panel and pillar with the sculpture also. The ‘zukklatura’ was also completed, along with eight busts of composers, four paintings and carpentry of the façade was completed by Sacco Woodworks of Mqabba. After the bad experience with foundry works, which was so bad that four of the bust had to be recast after completion, when the model of the railing surrounding the stands was completed contact with the local agents of Dei Domus company in Albano, located in the vicinity of Rome, were contacted for an estimate. 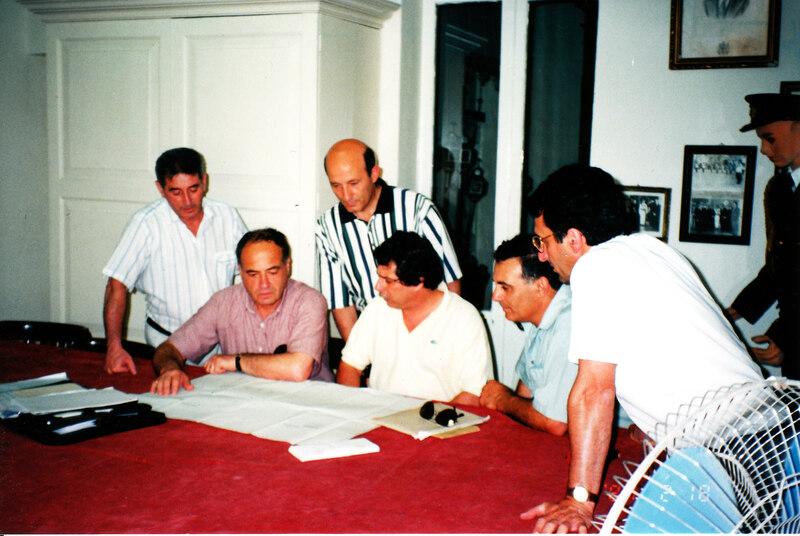 In November 2002, Lawrence V. Farrugia together with the representative of the Agent E. Theuma & Co., went to Albano for further discussions and actually concluded the agreement. The result was so amazing, the during the following March the bronze models model of the front of the stands were awarded to them and this work was completed in time and have been assembled at the 2003 Feast. The progress of the project depended on Saviour Bugeja as the leading designer and sculptor. But unluckily during the works Saviour injured his hands with the machinery and work stopped for several months. After that Saviour resumed work, he delivered the bronze models of the middle part of the facade. They were combined with design pilandri at the ‘Domus Dei’ where they agreed on the price and be completed by June 2006. The pilandri were not ordered because the price was Lm 28,000, in addition to being a weight problem to mount, as there would need the assistance of a crane. Thus contacts were made with J.A. 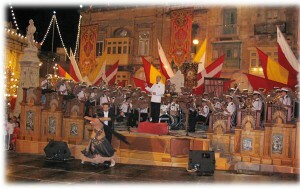 Aquilina firm, Qormi, and the twelve pilandri were ordered, where the first four completed and inaugurated for the feast of St. Lawrence in 2006. 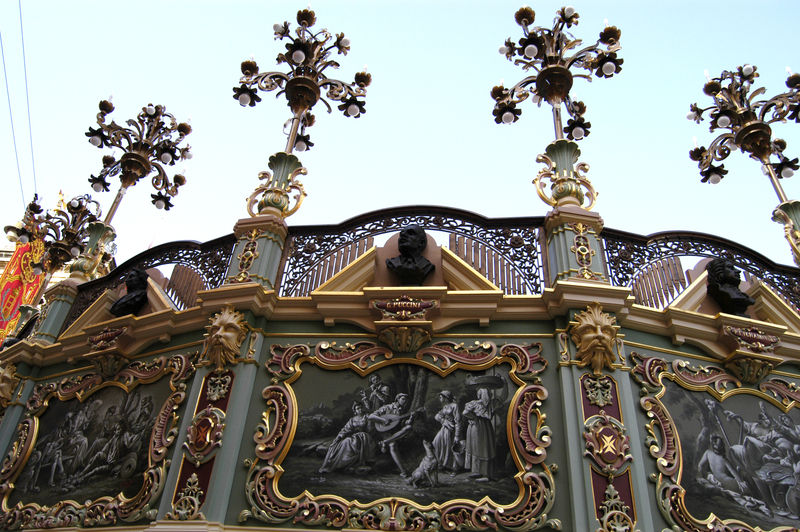 Now the band stand began to show its beauty, with all the surrounding sculpture ready, music stands and their columns painted, the paintings completed, the finished facade without sculpture, the railing of the whole bronze finished and four pilandri with pots in place. 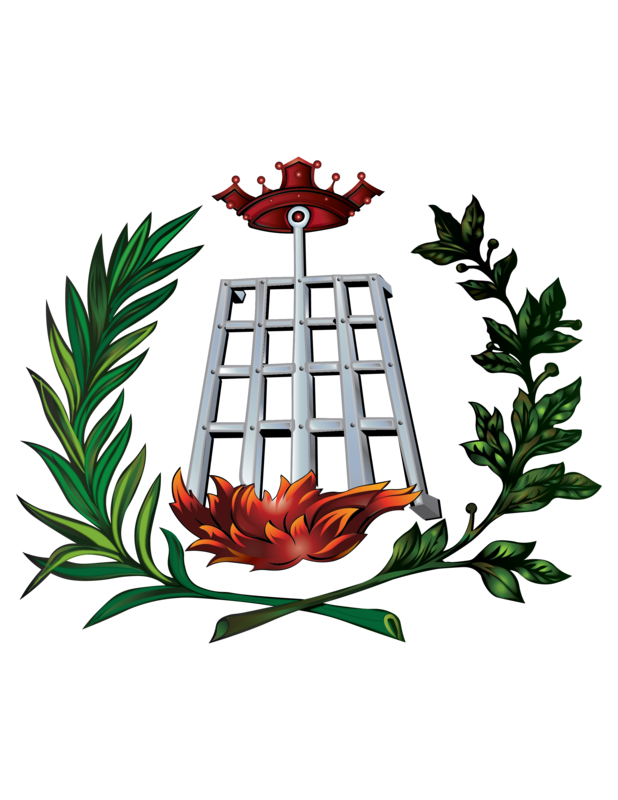 The Commission determined that by the feast of 2007, the project had to be given a push so as to be inaugurated before the Feast of 2008 when the club would be celebrating its 125th anniversary. Arrangements have been made with the Archpriest Can. Joe Caruana to equip the stands in the Parish Hall to arrange any gaps and change the change the method of how to mount the panels. In fact, instead of relying on the zukklatura, these would be mounted with the structure. The thinking behind this was to only change the zukklatura if the band stand was to be moved from the place where it is assembled for any particular reasons such as the rebuilding of the Clock Tower. Members of the sub-committee assisted by other members of the club started working, including paint and sanding of all timber, ready to be given to finishes and gilding. That work took a lot of time but this led to the club saving thousands of pounds. It was time to decide who was going to paint and guild the band stand. 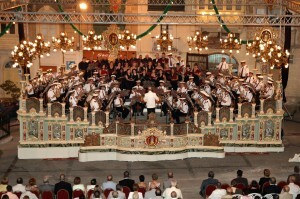 The Band Stand sub-committee and the Central Committee agreed and made a formal agreement with Andrew Bugeja assisted in gilding by Roderick Busuttil. The work was highly praised by both the designer Saviour Bugeja, as well as Vittoriosa people. 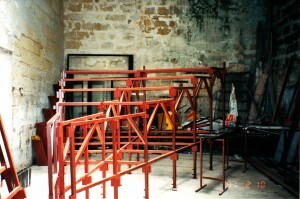 For the Easter 2007 the stands completed section was exhibited at the Club for public criticism. 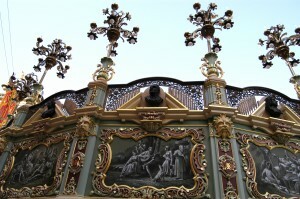 The result of great work with the coordination of all stakeholders involved in this project was seen in the 2007 feast because in addition to sculpture, paint and gilding of the facade, the band stand was almost finished. The weight of this project along with many other work in the club was well felt by the administration, especially those directly involved in the project. Thus grew the determination for the project to be completed by the 2008 feast. After the Feast 2007, meetings were held with Saviour Bugeja and Sacco Woodworks about modifications that had to be made in the front as well as the large amount of sculpture, paint and gilding. A number of ornamental bronze tubes for the façade needed to be completed as well. After the bad experience with the local foundry, it was decided that this work should also be ordered from ‘Domus Dei’ in Albano. One problem which preoccupied the sub-Committee for years was were the band stand was to be stored. Although attempts were made at various places, the society was not able to conclude the purchase or rental of a store. This situation seemed so difficult at the beginning of 2007 the Central Committee of the Club began proceedings with the local authorities and was given permission to build another room above the hall of the Club Concerts. But finally with the help of the Mayor and the Local Council, it succeeded in hiring a store below the belvedere that the Council built in Ħawli. The lease agreement was made on 9 January 2008. This project was rightly called ambitious, but had financial problems, indeed there were times that the sub-committee had the money but could not use them. Anyone who worked on this project was paid immediately, so much so that contractors said they wished everyone settled their payment like us. 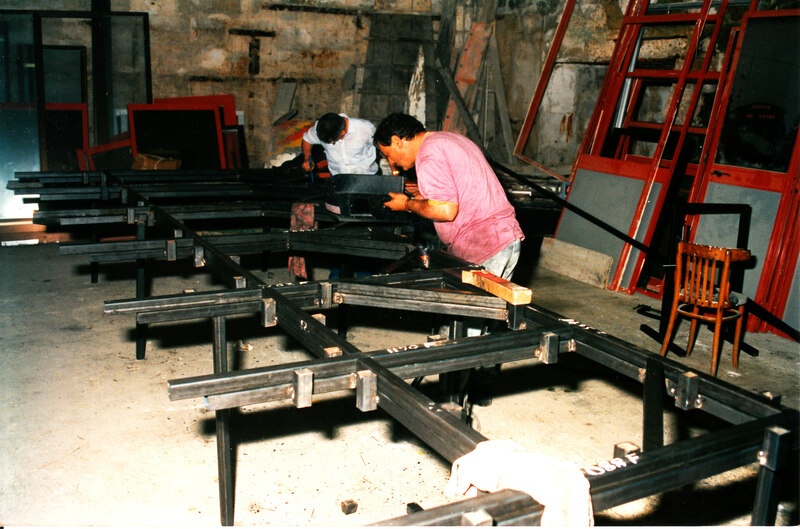 Many participated in this project, as the people of Birgu wanted to have an artistic stand in the square. The seats, the bust and most of the paintings were paid by individuals. Only the largest benefactor of the stands was Mr Joseph Scicluna and the Club itself. The stands besides its beauty is on a different style from others, is one of the largest in Malta, measuring about 38 feet horizontally. On the stands there is enough space for big band, choir and singers. 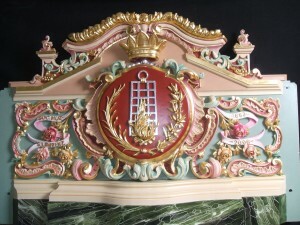 This Artistic Band Stand was inaugurated on Wednesday 30 July 2008 by the Honorary President of the Society, Mr Joseph Scicluna with the President of the Society Mr Lawrence V. Farrugia. A Vocal and Instrumental Programme from the Saint Lawrence Band Club was performed. This memorable occasion closed the celebrations that our band club organised to mark the 125 years of existence of the Society. However, although it was inaugurated, a music stand appropriate to the stands was still missing. Since the late Saviour Bugeja had died without leaving a design, disc ussions began with various designers for this project to become reality. After several attempts, Renzo Gauci’s design for the artistic musical stand was chosen. 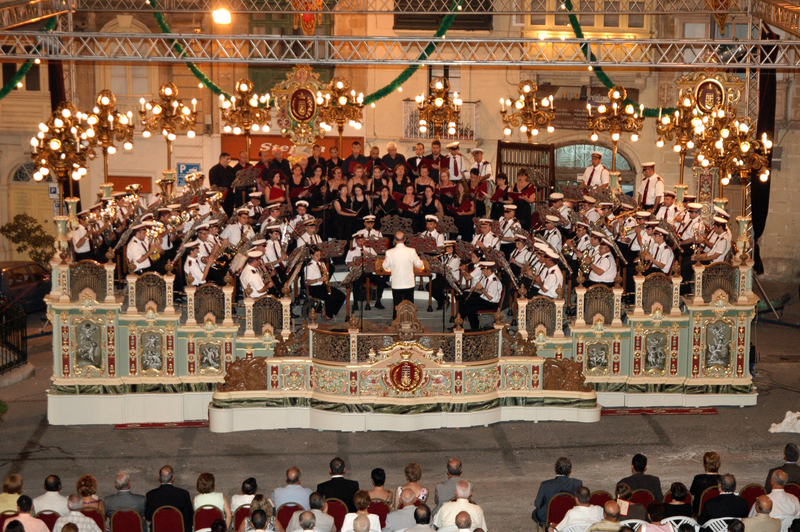 This lovely musical stand was inaugurated on 7 August 2014 by the President, Mr. Lawrence V. Farrugia and the benefactor behind this project, Mr. Konrad Baldacchino. 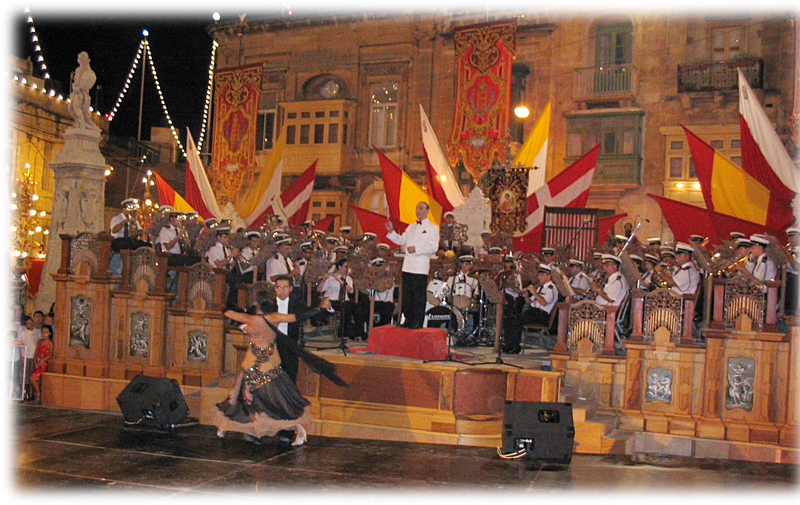 Finally we could say that one of the most beautiful Artistic band stands on the islands has been completed with a beautiful musical stand as befitting the main square of Vittoriosa.